For the Chimú-ruled state, see Chimor. 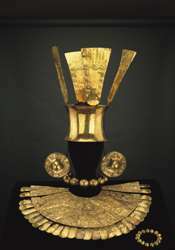 Chimú pottery and ceramics, Chan Chan, Gold ceremonial dress, A map of Chimu cultural influence within Peru. 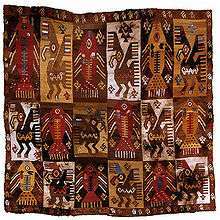 Chimú Tapestry Shirt, 1400–1540, Camelid fiber and cotton. Dumbarton Oaks. 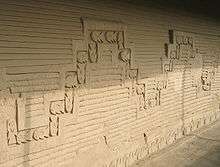 The Chimú culture was centered on Chimor with the capital city of Chan Chan, a large adobe city in the Moche Valley of present-day Trujillo, Peru. The culture arose about 900. The Inca emperor Topa Inca Yupanqui led a campaign which conquered the Chimú around 1470. This was just fifty years before the arrival of the Spanish in the region. Consequently, Spanish chroniclers were able to record accounts of Chimú culture from individuals who had lived before the Inca conquest. Similarly, archaeological evidence suggest Chimor grew out of the remnants of the Moche culture; early Chimú pottery had some resemblance to that of the Moche. Their ceramics are all black, and their work in precious metals is very detailed and intricate. The Chimú resided on the north coast of Peru: "It consists of a narrow strip of desert, 20 to 100 miles wide, between the Pacific and the western slopes of the Andes, crossed here and there by short rivers which start in the rainier mountains and provide a series of green and fertile oases." The valley plains are very flat and well-suited to irrigation, which is probably as old as agriculture here. Fishing was also very important and was almost considered as important as agriculture. The Chimú were known to have worshipped the moon and it is believed they considered it more powerful than the sun, which was preferred by the Inca Empire. Offerings played an important role in religious rites. A common object for offerings, as well as one used by artisans, was the shell of the Spondylus shellfish, which live only in the warm coastal waters off present-day Ecuador. It was associated with the sea, rainfall, and fertility. Spondylus shells were also highly valued and traded by the Chimú people. The Chimú are best known for their distinctive monochromatic pottery and fine metal working of copper, gold, silver, bronze, and tumbaga (copper and gold). 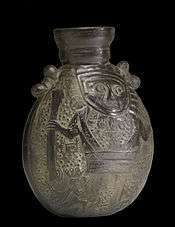 The pottery is often in the shape of a creature, or has a human figure sitting or standing on a cuboid bottle. The shiny black finish of most Chimú pottery was achieved by firing the pottery at high temperatures in a closed kiln, which prevented oxygen from reacting with the clay. Chimú vessel showing a sexual act between men. Museum of the Americas, Madrid. The Early pottery is also characterized by realistic modeling and painted scenes. The mature Chimú culture developed in roughly the same territory where the Mochica had existed centuries before. The Chimú was also a coastal culture. It was developed in the Moche Valley north of present-day Lima, northeast of Huarmey, and finishing in central present-day Trujillo. Later, it expanded to Arequipa. The Chimú appeared in the year 900: Chimor, also known as the Kingdom of Chimor, had its capital "at the great site now called Chanchan, between Trujillo and the sea, and we may assume that Taycanamo founded his kingdom there. His son, Guacri-caur, conquered the lower part of the valley and was succeeded by a son named Nancen-pinco who really laid the foundations of the Kingdom by conquering the head of the valley of Chimor and the neighboring valleys of Sana, Pacasmayo, Chicama, Viru, Chao and Santa." The Chimú expanded to include a vast area and many different ethnic groups. At its peak, the Chimú advanced to the limits of the desert coast to the valley of the Jequetepeque River in the north. Pampa Grande in the Lambayeque Valley was also ruled by the Chimú. To the south, they expanded as far as Carabayallo. Their expansion southward was stopped by the military power of the great valley of Lima. Historians and archeologists contest how far south they managed to expand. The Chimú society was a four-level hierarchical system, with a powerful elite rule over administrative centers. The hierarchy was centered at the walled cities, called ciudadelas, at Chan Chan. The political power at Chan Chan is demonstrated by the organization of labor to construct the Chimú's canals and irrigated fields. Chan Chan was the top of the Chimu hierarchy, with Farfán in the Jequetepeque Valley as a subordinate. This organization, which was quickly established during the conquest of the Jequetepeque Valley, suggests the Chimú established the hierarchy during the early stages of their expansion. The existing elite at peripheral locations, such as the Jequetepeque Valley and other centers of power, were incorporated into the Chimú government on lower levels of the hierarchy. These lower-order centers managed land, water, and labor, while the higher-order centers either moved the resources to Chan Chan or carried out other administrative decisions. Rural sites were used as engineering headquarters, while the canals were being built; later they operated as maintenance sites. The numerous broken bowls found at Quebrada del Oso support this theory, as the bowls were probably used to feed the large workforce that built and maintained that section of canal. The workers were probably fed and housed at state expense. The state governed such social classes until the empire of the Sican culture conquered the kingdom of Lambayeque, Peru. The legends of war were said to have been told by the leaders Naylamp in the Sican language and Tacayanamo in Chimú. The people paid tribute to the rulers with products or labor. By 1470, the Inca Empire from Cusco defeated the Chimú. They moved Minchancaman, the final Chimú emperor, to Cusco and redirected gold and silver there to adorn the Qurikancha. Chan Chan could be said to have developed a bureaucracy due to the elite's controlled access to information. The economic and social system operated through the import of raw materials, where they were processed into prestige goods by artisans at Chan Chan. The elite at Chan Chan made the decisions on most other matters concerning organization, monopolizing production, storage of food and products, and distribution or consumption of goods. The majority of the citizens in each ciudadela were artisans. In the late Chimú, about 12,000 artisans lived and worked in Chan Chan alone. They engaged in fishing, agriculture, craft work, and trade. Artisans were forbidden to change their profession, and were grouped in the ciudadela according to their area of specialization. Archeologists have noted a dramatic increase in Chimú craft production, and they believe that artisans may have been brought to Chan Chan from another area taken as a result of Chimú conquest. As there is evidence of both metalwork and weaving in the same domestic unit, it is likely that both men and women were artisans. They engaged in fishing, agriculture, and metallurgy, and made ceramics and textiles from cotton, llama, alpaca, and vicuña wool. People used reed fishing canoes, hunted, and traded using bronze coins. The Chimu capital, Chan Chan, had a series of elite residential compounds or cuidadelas that were not occupied simultaneously, but sequentially. The reason for this is that Chimu rulers practice split inheritance, which dictated that the heir to the throne had to build his own palace and after the death of a ruler; all the ruler's wealth would be distributed to more distant relatives. Chimú mantle, Late Intermediate Period, 1000 - 1476 AD. Design is alternating pelicans and tuna. Spinning is the practice of combining a small set of threads to achieve a long and continuous thread with the use of an instrument called a spindle. The zone is an instrument made of a small wand that usually gets thinner at both ends; that was used alongside a tortera or piruro. The spindle is inserted into the bottom to make a counterweight. It starts spinning, taking the rueca (where the fiber was set to be spun). Fibers that are laid down in the zone are quickly turned between the thumb and index fingers and twisted to interlock the fibers, creating a long thread. After the desired lengths of threads are attained, the threads are intersected and woven in various combinations to make fabrics. The Chimú embellished their fabrics with brocades, embroidery, fabrics doubles, and painted fabrics. Sometimes textiles were adorned with feathers and gold or silver plates. Colored dyes were created from plants containing tannin, mole, or walnut; and minerals, such as clay, ferruginosa, or mordant aluminum; as well as animals, such as cochineal. The garments were made of the wool of four animals: the guanaco, llama, alpaca, and vicuna. The people also used varieties of cotton, that grows naturally in seven different colors. The clothing consisted of the Chimú loincloth, sleeveless shirts with or without fringes, small ponchos, and tunics. The majority of Chimú textiles were made from alpaca wool. Judging from the uniform spin direction, degree of the twist, and colors of the threads, all of the fibers were likely prespun and imported from a single location. Earthenware jar, between 1100 and 1550. The Walters Art Museum. Chimú ceramics were crafted for two functions: containers for daily domestic use and those made for ceremonial use for offerings at burials. Domestic pottery was developed without higher finishing, while funeral ceramics show more aesthetic refinement. The main features of Chimú ceramics were small sculptures, and manufacturing molded and shaped pottery for ceremonial or daily use. Ceramics were usually stained black, although there are some variations. Lighter ceramics were also produced in smaller quantities. The characteristic brightness was obtained by rubbing with a rock that previously had been polished. 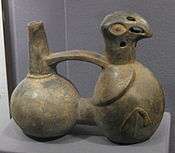 Many animals, fruits, characters, and mystical entities have been represented pictorially on Chimú ceramics. Metalworking picked up quickly in the Late Chimú periods. Some Chimú artisans worked in metal workshops divided into sections for each specialized treatment of metals: plating, gold, stamping, lost-wax, pearl, the watermark, and embossing wooden molds. These techniques produced large variety of objects, such as cups, knives, containers, figurines, bracelets, pins, crowns, etc. They used arsenic to harden the metals after they were cast. Large-scale smelting took place in a cluster of workshops at Cerro de los Cemetarios. The process starts with ore extracted from mines or a river, which is heated to very high temperatures and then cooled. The result is a group of prills (small round sections of copper, for example) in a mass of slag (other materials which are not useful for metallurgy). The prills are then extracted by crushing the slag, and then melted together to form ingots, which were fashioned into various items. Although copper is found naturally on the coast, it was mostly attained from the highlands in an area about 3 days away. Since most of the copper was imported, it is likely that most of the metal objects that were made were likely very small. The pieces, such as wires, needles, digging stick points, tweezers, and personal ornaments, are consistently small, utilitarian objects of copper or copper bronze. The Tumi is one well-known Chimú work. They also made beautiful ritual costumes of gold compounds with plume headdresses (also gold), earrings, necklaces, bracelets, and breastplates. Chimu pendant made of Spondylus shell and turquoise, 900-1470 CE (Dumbarton Oaks Museum, Washington, D.C.). The Chimú developed mainly through intensive farming techniques and hydraulic work, which joined valleys to form complexes, such as the Chicama-Moche complex, which was a combination of two valleys in La Libertad. The Lambayeque linked the valleys of La Leche, Lambayeque, Reque, and Saña Jequetepeque. They developed an excellent agricultural techniques which expanded the strength of their cultivated areas. Huachaques were sunken farms where land was withdrawn to work the moist, sandy soil underneath, an example of which is Tschudi. The Chimú used walk-in wells, similar to those of the Nazca, to draw water, and reservoirs to contain the water from rivers. This system increased the productivity of the land, which increased Chimú wealth, and likely contributed to the formation of a bureaucratic system. The Chimú cultivated beans, sweet potato, papaya, and cotton with their reservoir and irrigation system. This focus on large-scale irrigation persisted until the Late Intermediate period. At this point, there was a shift to a more specialized system that focused on importing and redistributing resources from satellite communities. There appears to have been a complex network of sites that provided goods and services for Chimú subsistence. Many of these sites produced commodities that the Chimú could not. Many sites relied on marine resources, but after the advent of agriculture, there were more sites further inland, where marine resources were harder to attain. Keeping llamas arose as a supplemental way of attaining meat, but by the Late Intermediate period and Late Horizon, inland sites used llamas as a main resource, although they maintained contact with coastal sites to use supplemental marine resources. They also made masks. In Pacasmayo, the Moon (Si) was the greatest divinity. It was believed to be more powerful than the Sun, as it appeared by night and day, and it also controlled the weather and growth of crops. Sacrifices were made to the moon, and devotees sacrificed their own children on piles of colored cottons with offerings of fruit and chicha. They believed the sacrificed children would become deified and they were usually sacrificed around age five. "Animals and birds were also sacrificed to the Moon". The Sun was associated with stones called alaec-pong (cacique stone). These stones were believed to be ancestors of the people in whose area they stood and sons of the Sun. Several constellations were also viewed as important. Two of the stars of Orion's Belt were considered to be the emissaries of the Moon. The constellation Fur (the Pleiades) was used to calculate the year and was believed to watch over the crops. There were also local shrines in each district, which varied in importance. These shrines are also found in other parts of Peru. These shrines (called huacas) had a sacred object of worship (macyaec) with an associated legend and cult. Mars (Nor), Sol (Jiang) and Earth (Ghisa) were also worshiped. In 1997, members of an archaeological team discovered approximately 200 skeletal remains on the beach at Punta Lobos, Peru. The bodies had their hands bound behind their backs, their feet were bound together, they were blindfolded, and their throats had been slashed. Archeologists suggest these fisherman may have been killed as a sign of gratitude to the sea god Ni after they conquered the fishermen's fertile seaside valley in 1350 A.D.
Tombs in the Huaca of the Moon belonged to six or seven teenagers from 13–14 years of age. Nine tombs were reported to belong to children. If this is indicative of human sacrifice, the Chimú offered children to their gods. Carvings of fish in the Tschudi Complex, Chan Chan. Differential architecture of palaces and monumental sites distinguished the rulers from the common people. At Chan Chan, there are 10 large, walled enclosures called ciudadelas,or royal compounds, thought to be associated with the kings of Chimor(Day 1973, 1982). They were surrounded by adobe walls 9m high, giving the ciudadela the appearance of a fortress. The bulk of the Chimú population (around 26,000 people) lived in barrios on the outer edge of the city. They consisted of many single-family domestic spaces with a kitchen, work space, domestic animals, and storage area. Ciudadelas frequently have U-shaped rooms that consist of three walls, a raised floor, and frequently a courtyard, and there were often as many as 15 in one palace. In the early Chimú, the U-shaped areas were found in strategic places for controlling the flow of supplies from storerooms, but it is unlikely that they served as storage areas. They are described as mnemonic devices for keeping track of the distribution of supplies. Throughout time, the frequency of the U-shaped structures increases, and their distribution changes. They become more grouped, rather than dispersed, and occur further away from access routes to resources. The architecture of the rural sites also support the idea of a hierarchical social order. They have similar structural components, making them mini-ciudadelas with rural adapted administrative functions. Most of these sites have smaller walls, with many audiencias as the focial point of the structures. These would be used to restrict access to certain areas and are often found at strategic points. One of the earliest known examples of distance communication is a Chimú device consisting of two resin-coated gourds connected by a 75-foot length of twine. Only one example has been found, and nothing is known about its originator or use. ↑ "Chan Chan : Capital of Kingdom Chimú - UNESCO". Retrieved 29 March 2012. 1 2 3 4 5 6 7 8 9 10 Rowe, John H. (1948) "The kingdom of Chimor", Aus Acta Americana 6, (1-2): 27. ↑ Ember, Melvin; Peregrine, Peter Neal, eds. (2001). "Chimú". Encyclopedia of Prehistory. 7 : South America (1 ed.). Springer. ISBN 978-0306462610. 1 2 3 Holstein, Otto. 1927. "Chan-chan: Capital of the great Chimu", Geographical Review 17, (1) (Jan.): 36-61. ↑ Bennett, Wendell C. (1937). "Chimu archeology", The Scientific Monthly 45, (1) (Jul. ): 35-48. 1 2 3 4 5 Keatinge, Richard W., and Geoffrey W. Conrad. 1983. Imperialist expansion in peruvian prehistory: Chimu administration of a conquered territory. Journal of Field Archaeology 10, (3) (Autumn): 255-83. 1 2 3 Keatinge, Richard W. 1974. Chimu rural administrative centers in the Koche valley, peru. World Archaeology 6, (1, Political Systems) (Jun. ): 66-82. ↑ Topic, J. R. (2003). "From stewards to bureaucrats: architecture and information flow at Chan Chan, Peru", Latin American Antiquity, 14, 243-274. 1 2 3 4 5 6 7 8 9 10 Moseley, M. E. & Cordy-Collins, A. (Ed.) (1990). The Northern Dynasties: Kingships and Statecraft in Chimor. Washington, D.C.: Dumbarton Oaks. ↑ "Chimú - Jar". The Walters Art Museum. ↑ Mosely, Michael E., and Kent C. Day. 1982. Chan Chan: Andean desert city. 1st ed. United States of America: School of American Research. ↑ "Mass human sacrifice unearthed in Peru". Retrieved 2009-10-09. 1 2 Moore, Jerry D. 1992. Pattern and meaning in prehistoric Peruvian architecture: The architecture of social control in the Chimú state. Latin American Antiquity 3, (2) (Jun. ): 95-113. 1 2 Topic, J. R. (2003). From stewards to bureaucrats: architecture and information flow at Chan Chan, Peru. Latin American Antiquity, 14, 243-274. 1 2 Moore, Jerry D. 1996. Architecture and power in the ancient andes: The archaeology of public buildings. Great Britain: Cambridge University Press 1996. ↑ Baldwin, Neil. "Can You Hear Me Now?" Smithsonian, Dec 2013: 66-67. Wikimedia Commons has media related to Chimu.